Every year, on the 10th day of the third lunar month, Vietnamese celebrates Hùng Kings Commemoration Day and millions of Vietnamese have the opportunity to be proud of noble origin – “Dragon’s Children and Fairy’s Grand Children”. Not only that but also this is the time for us to remember and be grateful for the merits of the Hung Kings who built our country. 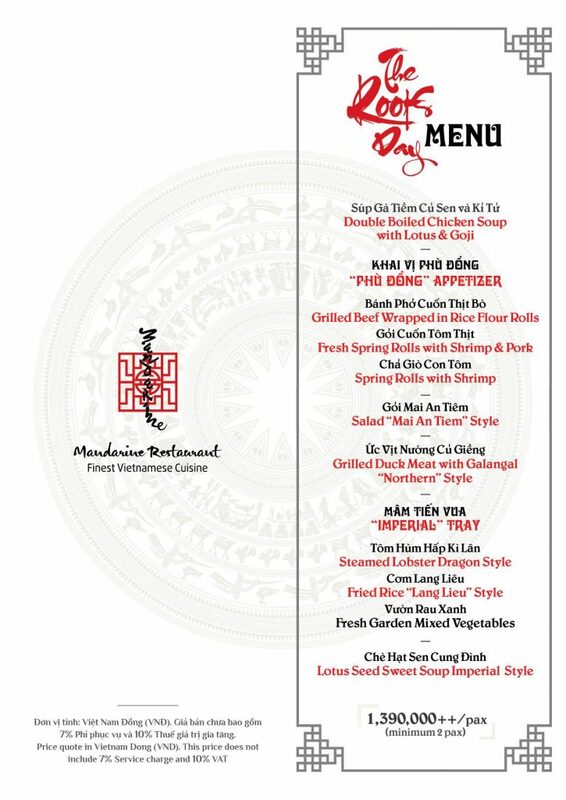 As a resident who always wanted to preserve and promote the national tradition, Mandarine would like to celebrate Hung Kings Festival with special programs only on 11th – 15th April 2019. In addition to the “Flamingo Traditional Music Performance”, “Cooking Show (For Reservation)” is an opportunity for diners to enjoy Chef demonstration, and be guided in processing Vietnamese traditional cakes from the talented chefs of Mandarine. An interesting highlight in the program is the special culinary, reappear perfectly “The Imperial Trays” that will surely bring diners unforgettable experiences. If you have no plans for this great holiday, Mandarine is a perfect idea that meets all the desires of delicious food and attractive entertainment programs.